Injinji, maker of the odd-looking, but patented Performance Toesock, which is designed to provide the freedom of being barefoot with the added protection of a sock, will sponsor an obvious fit: The New York City Barefoot Run. While there are many skeptics of barefoot running, sponsorship sales pros may want to consider getting a piece of the trend as brands jockey for their place in the movement. Proponents of the barefoot movement argue that it is healthier for feet and reduces risk of chronic injuries, caused by the impact of heel striking in padded running shoes. Barefoot running events, which are popping up in more than one city, usually include other events than just a run including educational clinics, expert panels and social events for the growing barefoot running community. Injinji, for their part, understands that growing awareness of the movement through event sponsorship is also a great way to grow their own brand. "Injinji is thrilled to be a part of this year's NYC Barefoot Run," said Deirdre Mahaney, marketing director for Injinji. "We share the excitement of promoting the health and performance benefits of natural movement, and this event effectively raises awareness by linking education, athleticism and collective fun." 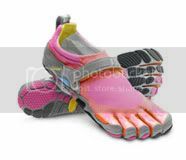 Vibram FiveFingers has been one of the category leaders with its specialized barefoot sports shoes and as the popularity of the movement has grown, traditional brands such as Saucony, Nike, Fila, Reebok and Adidas have all introduced barefoot-inspired running shoes. Something worth exploring if you're more than a little curious about the interesting new look you're seeing in parks and gyms throughout the country.